Dominick "Domo" Branch, the acclaimed young jazz drummer from Portland, has a college destination — with a little summer trip scheduled, too. 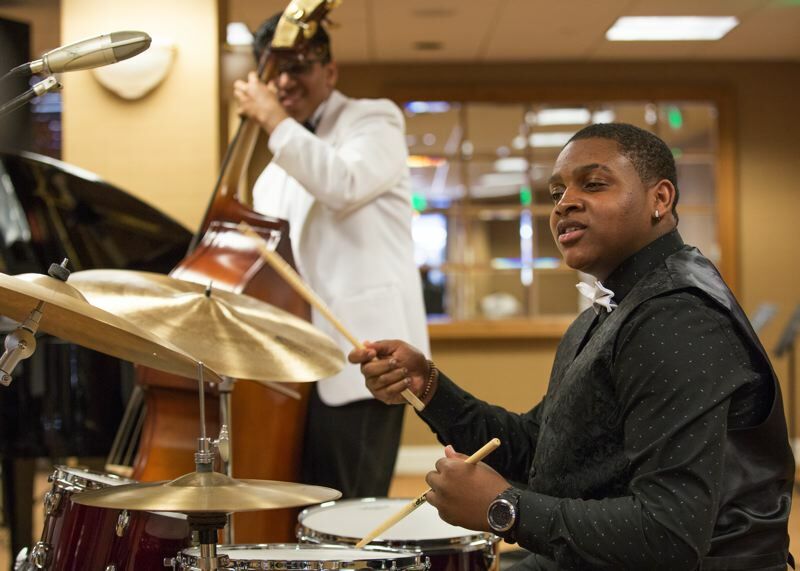 The Grant High School graduate will attend the Manhattan School of Music in New York City on a presidential scholarship, where he'll study with "a great drummer," Kendrick Scott. "I'm very excited to go and get better and learn more," says Branch, who was featured in the Tribune earlier this year. Scott, who's on the faculty of the school, "has a large influence on not only my musicality but how to live as well — such a great person to be around,and I'm excited I get to study with him." Branch, who starred at the Portland Jazz Festival this year and for the American Music Program and plays with pros around the city, also will be part of the NYO Jazz group that will play at Carnegie Hall, July 27. It's part of a four-week intensive nurturing program for young American jazz instrumentalists (ages 16-19), led by trumpeter/educator Sean Jones and featuring special guest artists Dianne Reeve and Wycliffe Gordon. Then, joined by Reeves, NYO Jazz will embark on an international tour, July 30-Aug. 10, with stops including London, Amsterdam, Edinburgh, Scotland, and Kassel and Berlin, Germany. "I'm very stoked to go and be a part of it," Branch says. "We're going to do our debut concert at Carnegie Hall, then we're going to Europe to play shows at wonderful concert halls. This is definitely one of the best things I've been part of, so far. It's a huge jump for me getting ready for college. 'Big Bang' is what I call it." So far, not even a segment on "NBC Nightly News" has helped the Rose City Rollers land a new venue for its teams and tournaments. The segment aired Sunday, May 27, and can be seen at nbcnews.to/2J2UYSA. Kim Stegeman, Rose City Rollers executive director, describes the situation to find a new home now as "horrible — no viable venues in sight." She says: "Everything is either too expensive, or too small, or too far from anything, or has way too much construction. We're plugging away trying to find a solution." People interested in helping can find more information at www.rosecityrollers.com/venue. Stegeman says a consulting firm has been hired to help with fundraising once the Rose City Rollers find a venue. Fire code and zoning rules at their current home, The Hangar at Oaks Park, are forcing the roller derby club to find a new home by July 1. Stegeman says the club needs a 25,000-square-foot building to lease or buy or a two-acre plot near transit to construct a building — with a clear span (no poles/horizontal beams), running water and parking. Oregon Ballet Theatre and Artistic Director Kevin Irving have announced some personnel changes for the 2018-19 season. Dancer promotions include: Anza Capizzi, from soloist to principal dancer; Katherine Monogue, from company artist to soloist; Kelsie Nobriga, from company artist to soloist; Theodore Watler, from apprentice to company artist. Capizzi (formerly Deguchi, from Nagoya, Japan) makes the jump to principal dancer after starting as apprentice in 2003 and being promoted to soloist in 2007. She distinguished herself as a ravishing Juliet in James Canfield's "Romeo and Juliet" in 2016 and in Septime Webre's "Alice (in wonderland)" last season. Joining the company are: Matthew Pawlick-Sinclair, soloist; Abigail Diedrich and Hannah Davis, company artists; Theodore Skye Stouber, Zuzu Metzler and Marc LaPierre, apprentices. Departing OBT are principal dancer Jacqueline Straughan, Martina Chavez, Keenan English, Avery Reiners, Paige Wilkie and Andrew Wingert. There'll be a reception for the new Oregon Media Arts Fellowship winners, 1 p.m. Sunday, June 10, at Whitsell Auditorium, 1219 S.W. Park Ave. The recipients are Howard Mitchell, Julia Oldham, Roland Dahwen Wu and Arianna Gazca. Each will give a short presentation on their current projects and past work. In addition, there'll be a screening of short works by past fellow winners, including Edward Davee III, Kurtis Hough and Julie Perini. The Oregon Media Arts Fellowship is given each year to filmmakers who have shown a commitment to the moving image arts and pushing their practice with new and engaging work. It's administered by the Northwest Film Center, and funded by the Oregon Arts Commission and Oregon Community Foundation. The Regional Arts & Culture Council has awarded $451,037 in project grants to 59 artists and 29 nonprofit organizations in the Multnomah, Washington and Clackamas counties. RACC reports that 56 percent of all project grants went to first-time recipients. They were presented with awards in categories of Artistic Focus, Arts Equity and Access and Arts Services. Examples funded include: Julia Bray's "Matter is Mother," a one-woman magical comedy show; Derrais Carter's archive/poetry/visual art project for black girls to challenge historical narratives; M. Allan Cunningham's multigenerational mystery novel, "Perpetua's Kin; the World Arts Foundation Inc.'s historic album release featuring Albina records from the 1960s-'80s. Details for the fifth annual Rip City 3-on-3 Basketball Tournament have been released. It'll take place July 28-29 at the Rose Quarter, and feature divisions for all ages, abilities and skill levels. Proceeds benefit the Trail Blazers Foundation, which invests in organizations working to improve lives of historically underserved youth and families. Registration is open at www.ripcity3on3.com until July 20. There'll be about 50 courts staged throughout the Rose Quarter campus.